The 22 seconds between the first command a San Francisco police officer gave to Luis Gongora and the final gunshot that killed him show a clear violation of current SFPD policies, accountability advocates and Mission District residents told department brass and police commissioners at a series of meetings Wednesday over the first fatal police shooting in the city this year. Aspects of the shooting remain obscured -- anything Gongora was doing, for example, is outside the frame of surveillance video published by SFGate last week. But the brisk approach of officers toward a man who allegedly had a knife, was in an altered mental state and wasn't a threat to anyone else has drawn attention toward years-old SFPD policies that officers should essentially foster "time and distance" in those circumstances. "I’ve been talking time and distance and de-escalation -- that’s pretty much all I’ve been talking about all of 2016," Police Chief Greg Suhr said Wednesday. "So there’ll be a lot of questions about tactics on why that didn’t happen." "Any officer may not discharge a firearm at a person who presents a danger only to him or herself, and there is no reasonable cause to believe that the person poses an imminent danger of death or serious bodily injury to the officer or any other person." "They are held responsible if they are the ones that create the imminent danger," retired ACLU attorney John Crew told SFPD leadership, including Suhr, at a town hall meeting on the shooting Wednesday afternoon. "If their actions are rash and overly aggressive, your policies hold them accountable for causing a chain of events that cause an avoidable death." "The question is the professional conduct of the department," Crew said, noting the 3-year-old policy. "I beg of you to speak out about it and to enforce it. Because the messages the officers are getting, as we saw from Mario Woods, if they create the imminent danger, they can shoot. They may not go to jail for homicide for that. But they should be responsible for their conduct." Mario Woods was shot and killed by five SFPD officers on Dec. 2, 2015. Multiple bystanders captured cellphone video of the shooting, which prompted a redrafting of department use-of-force policies still in the works and a federal Department of Justice review. Suhr said the officers' tactics in the Gongora shooting would be reviewed, as they are with every officer-involved shooting. That's the purview of a Firearms Discharge Review Board made up of SFPD deputy chiefs that meets quarterly. Despite repeated questions, Suhr did not say whether officers would be disciplined for a failure to step back and possibly diffuse a potentially violent encounter. "We will look at the tactics involved in this and we will make adjustments, always, to see if we could do it better," Suhr said. "Accountability is different from adjustments to tactics," Mission resident Gerard Koskovich said. "Accountability is officers are disciplined." The Police Department continued to release pieces or interpretations of witness statements Wednesday, including two from members of the San Francisco Department of Public Health homeless outreach team who initially called 911 to report a "male waving a large kitchen knife," according to computer-assisted dispatch records presented at the meeting. "The HOT team workers describe Mr. Gongora as appearing in an altered mental state, either mentally or chemically induced, and they saw he was in possession of a large knife," Suhr said. "One HOT team member described his actions as swinging indiscriminately as he walked down the street." 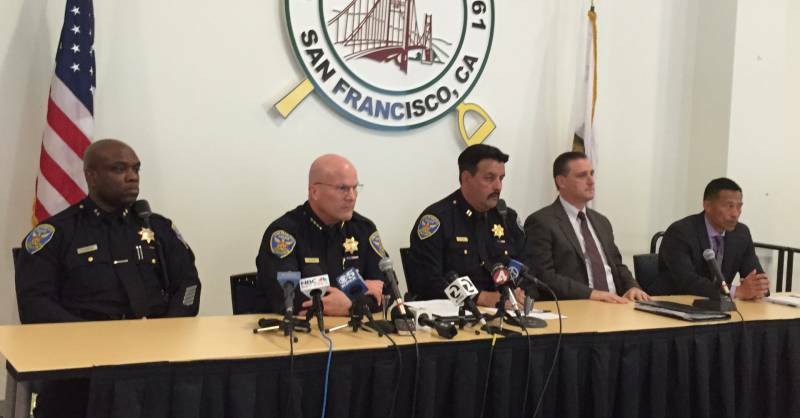 Supervisor David Campos took issue with the witness statements the department presented at Wednesday's meeting and last week, at a press conference called by the head of SFPD's investigations bureau. "You have an ongoing investigation, supposedly to find out what happened in this incident, and yet you’ve had a number of press conferences where you are already prejudging what happened in this case," Campos said to Suhr. "How can you say that you’re having an independent investigation, when you are already saying, 'This is what we believe happened?' "
"I didn’t say what I believe happened," Suhr said. "I’ve given the facts that came from interviews, simply." 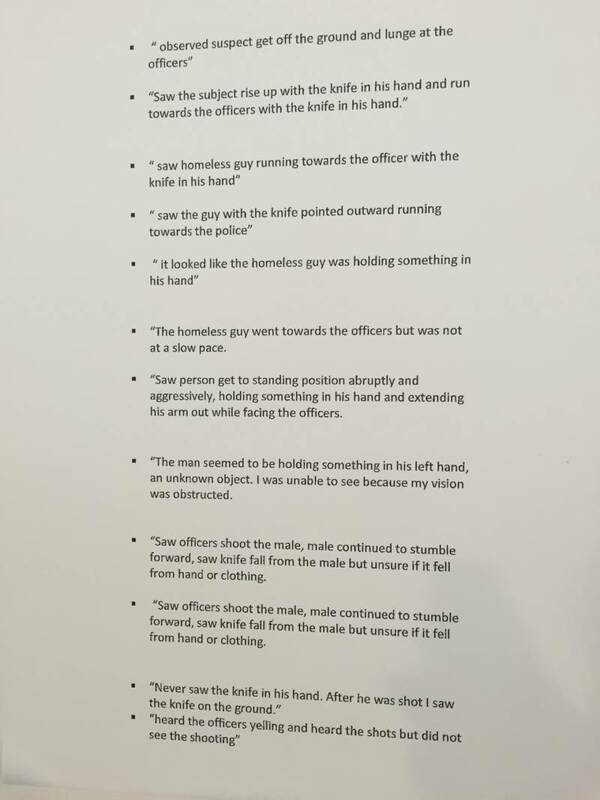 But the singular quotes provided from presumably longer witness statements left many attending the town hall meeting with a sense that homicide investigators were attempting to present only statements that justified the officers' use of deadly force. "You did not state there have been contradictory statements from witnesses," Koskovich said, noting that news reporters have talked to and published accounts from several witnesses who said Gongora did not have a knife in his hand, and he never moved toward the officers. "Some say that the officers engaged in actions that were inappropriate. Some said that Mr. Gongora did not pose a threat. Some said that he was not holding a knife. You didn’t say any of that." Police commissioners had similar questions for the chief at a meeting Wednesday evening. "I’ve seen just on news reports that there are individuals who give a different version of the facts," Commission President Suzy Loftus said. "That leaves folks feeling like one version of the facts is being presented." Other commissioners asked why the officers would approach Gongora so quickly, in apparent violation of department policies. "I just heard shouting, just shouting," commissioner Petra DeJesus said of the surveillance video. "I did not hear anything that would indicate de-escalation or anything that would put time and space." Suhr said officers for their entire careers have been trained to move toward and engage a threat, and changing the mentality will take time. "That said, the conversation has been robust and has been robust here and has been at all the stations," he said.